Ø Try to keep your first aid kit small and simple. Stock it with multi-use items. Almost anything that provides good visibility of contents can be used for a household first aid kit. Ø If your kit will be on the move, a water-resistant, drop-proof container is best. Ø Inexpensive nylon bags, personal kits, fanny packs, or make-up cases serve very well. Ø You do not need to spend a lot of money on a fancy "medical bag." Use re sealable sandwich or oven bags to group and compartmentalize items. Ø Put wound supplies in one bag and medications in another. Make sure you know how to properly use all of the items in your kit, especially the medications. Train others in your family to use the kit. You may be the one who needs first aid! Pack and use barrier items such as latex gloves to protect you from bodily fluids of others. Check the kit twice a year and replace expired medications. ü The best place to keep your first aid kit is in the kitchen. Most family activities take place here. The bathroom has too much humidity, which shortens the shelf life of items. ü The travel kit is for true trips away from home. Keep it in a suitcase or backpack or dry bag, depending on the activity. ü A first aid kit for everyday use in the car should be just like the home first aid kit. For that matter, you could keep similar kits in your boat (inside a waterproof bag), travel trailer, mobile home, camper, cabin, vacation home, and wherever you spend time. Diphenhydramine (Benadryl) - Oral antihistamine for allergic reactions, itching rashes. Avoid topical antihistamine creams because they may worsen the rash in some people. 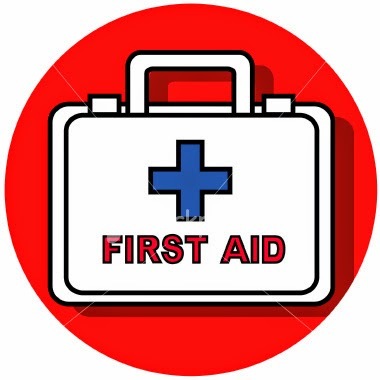 "Learning First-aid is a civic responsibility of each and every person"
May be defined as "on the spot" and immediate help or aid to help any fellow being in physical distress or serious disease, which may be life threatening. But do not do or attempt anything in which you have no expertise. DON'T be Panicky & run helter shelter. DON'T rush out through same exits - use emergency exits. DON'T be too selfish, be helpful to other victims. Once out of danger area/site of accident move victims to safer and open place. Try to clean soot from nostrils with any clean cloth, preferably wet. If victim is dazed or unconscious - remove or loosen constricting dress or ornaments on neck and chest. If victim is not breathing, give mouth to mouth breathing. Evacuate all serious victims to nearby clinic or Hospital. Learn Heimlich manoeuvre in case of choking while swallowing. Inform electricity department if you see any loose connection, detached wires on road side. Don't walk blindly at night in rainy season. Keep electrical goods and plug points out of reach of children. Push the victim off the contact, protecting yourself, using proper insulation. Stand on a bundle of newspaper. Cardiopulmonary resuscitation (CPR) if necessary. In case of electrical burn, treat and give first aid as in burn or fire accident. generally occurs due to consuming contaminated water or food. It is fairly common in places where mass cooking takes place. Food handlers like cooks & servers are the main culprits. It can also occur at home. Cook food items, especially meat, properly & well. Do not allow diseased individuals inside the kitchen. Do not purchase food items from unauthorised and unhygienic shops. Don't consume any food items beyond the expiry date. Keep kitchen / place for cooking clean and free from lizards and flies. Ensure proper hygienic measures by all food handlers - like trimming finger nails, disease free fingernails, washing hands with soap and water after toilet, before handling any food items. Avoid eating or drinking juices etc. on roadside, where flies are likely to contaminate. Identify the culprit food item. Seek medical advice for all those affected. Educate victims and public how to safeguard one self. Do not keep poisonous chemicals within reach of children; keep them under lock. In case of suspected poisoning, induce vomiting by putting finger into mouth and throat or by giving salted water. Keep the victim flat, head turned to one side when vomiting. Keep sample of vomits for analysis. Remove soiled clothes & wash out any stains over the body. Seek expert medical aid as soon as possible. Obey traffic rules and give proper signals while driving. Anyone suffering from fits or under the effect of sedatives, alcohol etc - not to drive a vehicle. Carefully extricate victim from vehicle. Do not handle wounded (fractured) limb unnecessarily. See if victim is breathing and check pulse. Clean and remove any loose material inside mouth and throat to clear airway. Keep victim in lying position and in safe place. Control bleeding by application of pressure with folded clean cloth. While shifting, shift in one piece to prevent dislocation or aggravation of spine injury. Loosen or cut garments or ornaments causing pressure on neck, chest or abdomen. Seek expert medical advice at the earliest to transport and treat the victim. every time a person goes into fits, it is injurious to his health and can produce complications. He should take prescribed preventive drugs regularly and as long as advised by his doctor. Epileptic should not be allowed access to fire in kitchen, swimming pool, moving machinery or car driving. Not to go or work at heights, unattended. Turn head to one side in lying position, to allow saliva to come out. Clear airway as in any unconscious patient. Elevate lower jaw and press on chin to keep mouth open and avoid biting tongue. Keeping any blunt object or folded kerchief between teeth to prevent biting tongue to be done cautiously, since pushing there too far into throat will cause obstruction to airway. Arrange to seek medical attention. If a person has collapsed or fallen down or found unconscious, it may be due to several diseases. The first aider should do no harm; he should ensure that victims breathing & heartbeat is restored and try and prevent any further harm to the victim. Turn head to one side to allow vomits or saliva to come out. Clear airway and mouth if obstructed. Do not give any oral feeds to an unconscious patient. Keep the victim warm - don't leave him unattended. Arrange to get medical attention at the earliest. Turn victim face down with head turned to one side and arms stretched above the head. Children can be held upside down. Raise belly of victim to drain water from the lungs. Remove wet cloth and keep body warm. If victims is conscious hot drinks may be given. Transfer to nearby hospital at the earliest. Following common situations in our daily life predispose to burn accident. Avoid them. Nylon and other inflammable dress in the kitchen. Use of open flame bed-lamp. Not taking proper precautions while using cooking gas. Children and epileptics in kitchen, without supervision. Firing crackers inside the house. Not taking proper precautions while using electrical appliances. Storing inflammable materials like petrol in the house. Victim of fire accident should lie on floor and roll slowly. Put out flame by covering with thick blanket. Pour water or even mud or sand (in an open place) to put out the fire. Use ice cold water or compresses- start early and continue for 15-20 minutes. Wash hands and remove tight rings and bangles and loosen dress. Don't apply any local medication till a qualified Doctor sees. Cover the burn victim with clean or freshly laundered cloth. For chemical burn, bathe the affected area with plenty of water - victim to have a good shower. Loosen and remove dress soaked in chemical. For electrical burns, switch off the mains before attending to the victim or take due precautions against getting a shock oneself. Seek medical help as early as possible. CPR (Cardiopulmonary Resuscitation) For Yourself: What To Do If You Have a Heart Attack While You Are Alone. The Johnson City Medical Centre (USA) staff actually discovered this, and did an in-depth study on it in our ICU. The two individuals that discovered this then did an article on it, had it published, and even had it incorporated into ACLS and CPR classes. It has worked, and does work. It is called "Cough CPR". A cardiologist says it's the truth. Read this — it could save your life! Let's say it's 6:15 PM and you're driving home — alone of course — after an unusually hard day on the job. You're really tired, upset, and frustrated. Suddenly you start experiencing severe pain in your chest that starts to radiate out into your arm, and up into your jaw. You are only about five miles from the nearest hospital. Unfortunately you don't know if you'll be able to make it that far. What can you do? You've been trained in CPR (Cardiopulmonary Resuscitation), but the guy that taught the course didn't tell you what to do if it happened to yourself. First advice: pull to the side of the road, stop your car, and turn the flashing hazard lights on. Since many people are alone when they suffer a heart attack, this article seems to be in the order. Without help, the person whose heart is beating properly, and who begins to feel faint, has only about 10 seconds left before losing consciousness. However, these victims can help themselves by coughing repeatedly, and very vigorously. A deep breath should be taken before each cough, and the cough must be deep and prolonged, as when producing sputum from deep inside the chest. A breath and a cough must be repeated about every two seconds without let up until help arrives, or until the heart is felt to be beating normally again. Deep breaths get oxygen into the lungs, and coughing movements squeeze the heart and keep the blood circulating. The squeezing pressure on the heart also helps it regain normal rhythm. In this way, heart attack victims can get to a hospital.